Anyone can take a step closer to the Abbey Road experience by using the studios’ first ever app, Topline. 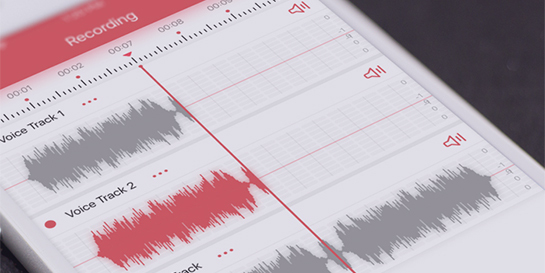 The free app helps musicians record their musical ideas instantly and precisely, sketching the beginning of a song as it happens. You can share files easily, sing over imported tracks, add lyrics, tags and pictures, find previous work quickly, and always have space for new ideas by syncing songs to your cloud storage. To develop Topline, Abbey Road worked closely with emerging songwriters and producers from across London to understand their creative needs. They all shared a big concern about losing original song ideas – either through not being able to capture them easily when they occurred or by having issues locating them later. This sounded like a challenge that Abbey Road could readily solve, and they did so by designing the intuitive and simple-to use-app with music at its heart. 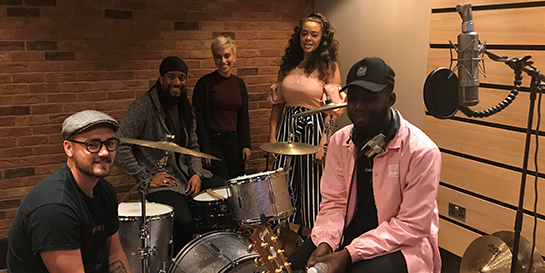 Indigo Palace (pictured far left, far right) and BLOOM (centre), artists on Universal’s distribution platform Spinnup, were given an early preview of the app and invited to be a part of its launch at Abbey Road Studios. Topline is the latest in a series of innovations designed to bring the Abbey Road magic closer to a wide range of music makers. This includes the online mastering and mixing alongside Abbey Road Red, a start-up incubator which has guided emerging music tech companies to success, as well as the opening of two new affordable studios and a Metro-sponsored Battle of the Bands competition. Topline was launched this week on IOS in the UK, with plans to take it to the rest of the world. You can download the app today via the App Store – click here.